Well, I understand why you might feel that way, but I disagree. I think smartwatches are the kind of thing you only understand after you’ve used one because, unlike with smartphones, there’s no single phrase you can say that sells people on a smartwatch. Smartphone: “You have the internet in your pocket.” Boom, done. Here’s all my money. Society is changed forever. “You can have notifications on your wrist.” Okay, great. I don’t care. “It’s also a fitness tracker.” I own a fitness tracker already/my phone does that/I’m lazy and don’t care to be less lazy. “I can issue voice commands and respond to text messages and IMs with my voice.” Okay, that’s kind-of cool, but not life-changing, internet-in-your-pocket cool. Smartwatches are difficult to sell people on because they are more than the sum of their parts. It’s not just that you can see and respond to notifications on your wrist, or navigate without taking your phone out, or set a quick reminder, or take a quick note, or monitor your current run or bike ride. It’s all of those things and how moment by moment, they make your life a bit better in small ways – ways you don’t notice until you stop wearing a smartwatch and suddenly feel a bit crippled. I think even Apple, with all of their marketing prowess, is going to have their hands full convincing people they need one at first. This might be why we’ve seen them take the uncharacteristic “put every feature in here and see what sticks” approach to the Apple Watch – it’s quite possible they’re just hoping something will click with the average consumer and become a reason to spend $350+, whether it’s tapping messages to neighbors or staring at tiny family photos on your wrist, or something we haven’t actually seen yet. Apple’s secret weapon may end-up being peer pressure; if enough people buy into the concept of the Apple Watch, then suddenly a large chunk of your social circle could be communicating in a unique way that doesn’t include you. It’s like the iMessage effect, except with even more hardware buy-in required to participate. Of course, that depends on enough people buying into the Apple Watch concept out of the gate, which I think is still a big question mark. Well, that was a lot of rambling…but I still think smartwatches are dumb. That’s fine. I don’t think smartwatches are for everyone, but I think the people who love them will really love them. If smartphones are our surrogate brains, then I’ll gladly use a device that helps make that surrogate brain a bit more useful and efficient. 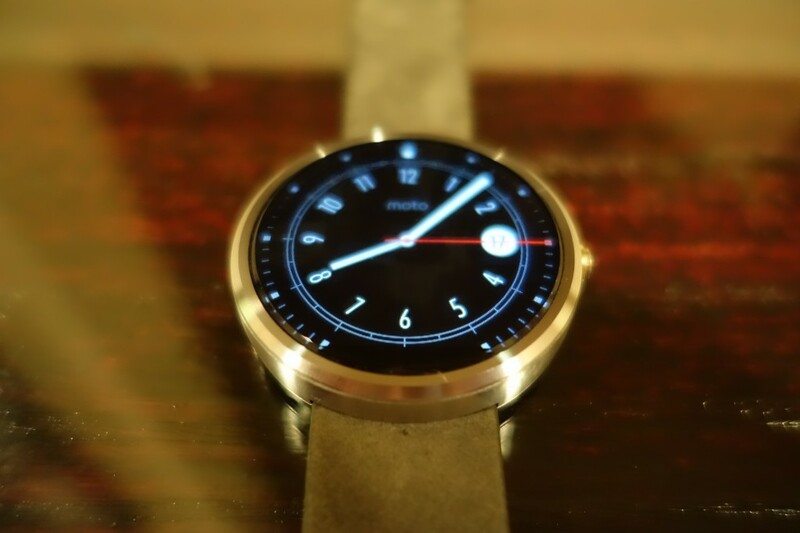 Okay, let’s say I want a smartwatch – should I buy a Moto 360? I don’t think most people should buy any smartwatch at this point, because as much as I love the concept, the implementation still isn’t particularly mass-market friendly. The 360 also has its own unique quirks that make it even less mass-market friendly. So are you going to return yours? Oh, no no no. Dear God, no. I really like this thing. 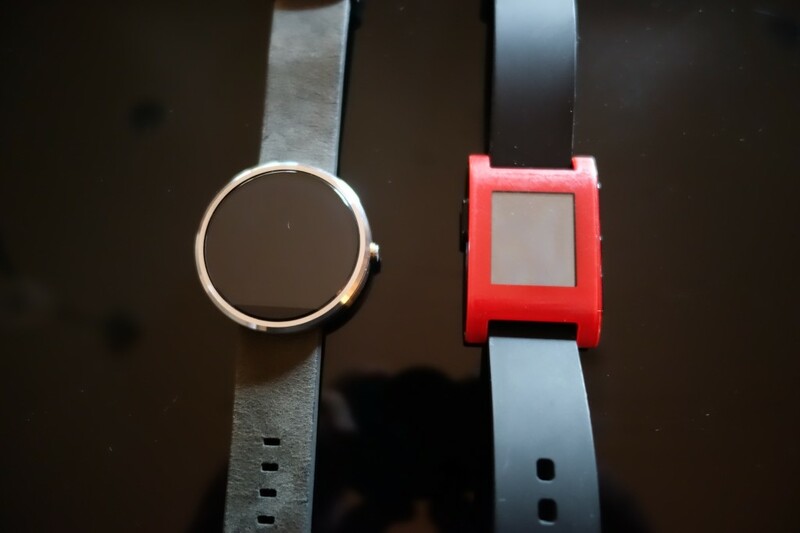 I’m completely sold on smartwatches, and I can’t imagine going back to my Pebble now. Also, the 360 has a couple of features that no other existing-or-announced Android Wear device has that I think are so vital to the experience that I won’t buy any other smartwatch without them. What features? You mean the round display? No, not exactly. The LG G Watch R also has a round display, and looks pretty nice. I still think the 360 looks better, but obviously that will vary greatly from person to person. I’m talking about the ambient light sensor, and wireless charging. The ambient light sensor seems like the sort of feature that every smart-device should have by default, but somehow, the only other Android Wear watch announced that has one is the Sony Smartwatch 3. Call me high-maintenance, but the instant I have to dig into the brightness settings of my watch just because I had the gall to step outdoors, I am out. The Arizona sun is way too bright to even consider owning a watch that can’t adapt to it. The best thing I can say about the 360’s brightness is that I’ve never had to think about it. Wait, I have to charge this thing every night? Yup. Sorry about that. Battery life isn’t quite as bad as initially reported (pro-tip: don’t trust what a reviewer tells you about a device’s battery life unless they’ve used it for at least a week), but it’s…still kind-of bad. I thought, at first, that it was unacceptably bad, but after a couple of days of settling in, it’s reached levels that I consider acceptable to me. Barely. I worry for how its battery capacity will fare going forward, given that batteries tend to lose a chunk of their capacity over time, but then, such are the risks of being an early adopter. Fortunately, #2 has proven to be unnecessary, though I still generally take my watch off when I’m at home, especially if I’m going to be using the computer. The good news is that this thing charges crazy fast compared to something like a phone – expect close to 2% every minute or so – so if you’re expecting a late night, you can toss in on the charger for 20-30 minutes and be good to go. There are, of course, going to be times when it will probably die on my wrist – if I go out for a late night without stopping by my house, for example. I consider those edge cases, though, and honestly, my phone will probably die before my watch either way – using a Nexus 5 means learning to tolerate kind-of crappy battery life. At first, I was annoyed at having another device whose battery life I was constantly aware of, but after a few days, I started treating it like my Pebble – ignoring battery life and just letting it be – and it’s been fine. Inevitably, there will be many who consider this unacceptable, especially considering this is in the default mode, meaning the watch face only lights up when you manually activate it with a wrist motion or a tap, or when a notification comes in. If you want to have an “always on” watch face similar to the Pebble, or even the Gear Live or the LG G Watch…you won’t make it through the day. Period. For me, it works – I accept the sub-par battery life, because it gives me three things no other smartwatch currently does: an ambient light sensor, wireless charging, and a fantastic design I’m not embarrassed to be seen in public with. Is the design really that good? Of course, like all other smartwatches, it’s also big. If you don’t want a big watch, this isn’t the watch for you. How’s that display? What about that ugly black bar at the bottom? The IPS display doesn’t quite reach the insane pixel density of modern smartphones, or even modern laptops and tablets, so you will definitely notice pixels if you look for them. Of course it’s a huge upgrade from my Pebble, and it’s great in other ways – most notable its viewing angles and outdoor visibility. Also, some notifications – especially full-screen album art – are gorgeous on it. Pictures don’t really do them justice, but I tried anyway. As for the black bar, I barely notice it, and even when I notice it, I don’t care. If the choice is between a tiny bezel and a black bar, or a big bezel and no black bar, I’ll take the tiny bezel every time. How about that ancient processor? If you haven’t heard, the Moto 360 runs a processor from 2010 – the TI OMAP3630, which was used in the Droid X and the MotoACTV. Why? I don’t know, but if I had to guess, it was to cut costs – Motorola probably still has plenty of those lying around, and Android Wear runs good enough on them that they figured they may as well use them. If that was what it took to get the cost down to $250…I think they made the right choice, as I don’t think I’d spend much more on a smartwatch at this point. That said, the difference between it and the Snapdragon 400 that other Android Wear watches have is noticeable, if only just. If having the latest and the greatest processor is important to you, then it’s quite possible the 360 isn’t for you. Personally, when it comes to wearables, I’m not interested in staring at the spec sheet, and I’ll choose the lifestyle benefits of a light sensor and wireless charging over a more modern processor any day of the week – even if it means the occasional hitch and stutter, and overall poorer battery life. 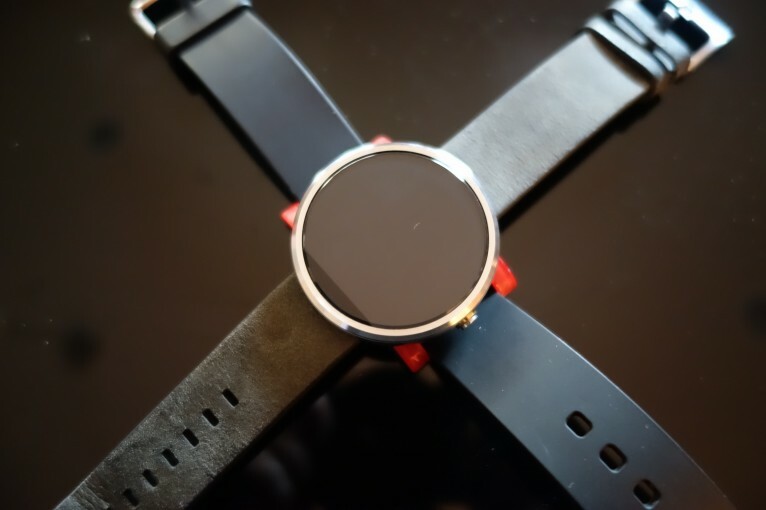 That isn’t to say I don’t dream of a Moto 360 running a better processor – I just don’t get too hung up over it. Anything else about the hardware? The vibration motor is pretty weak if you’re used to a Pebble; I think I prefer it to the over-enthusiastic Pebble, but if you’re used to the Pebble, it’s worth noting, and you may miss the occasional buzz here and there. Every now and then, the device will ignore my first attempt to wake it, whether it’s through motion or a direct tap on the screen. Not sure if that’s a hardware or software thing, though. I’ve occasionally had it disconnect from my Nexus 5, but not any more frequently than my Pebble seemed to. Like any touchscreen, the Moto 360’s screen will inevitably end up covered in fingerprints – which is an unfortunate state for something you’re always looking at – but I’ll take temporary fingerprints to my Pebble’s infinitely-scratched screen any day of the week. The leather strap it comes with is fine, but I look forward to replacing it with a metal strap at some point. That’s a lot about hardware. What about software? It’s running Android Wear, which I haven’t talked about before because I haven’t had all that much experience with. Think of it as Google Now on your wrist, plus notifications, and you have a large idea of what it can (and can’t) do. I’ve often heard it called a 1.0 product, and it’s hard to disagree. 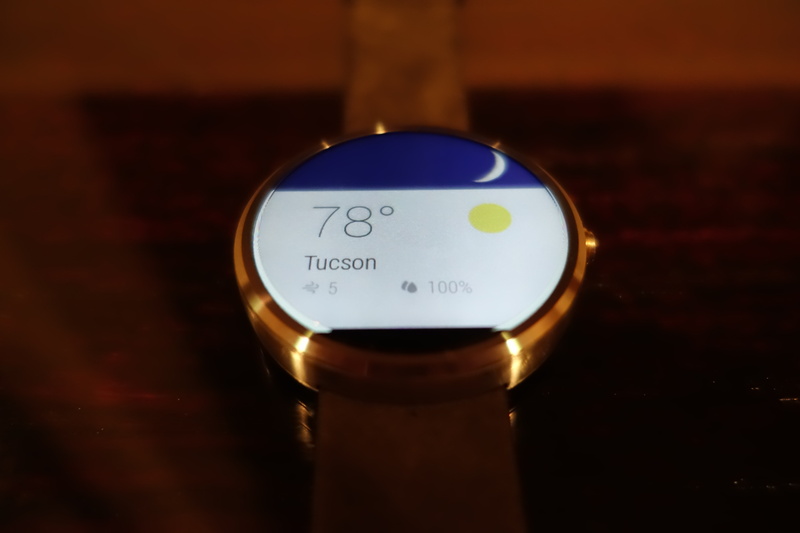 When it works, especially on a device like the Moto 360, it feels like the future. When it doesn’t, it can be an exercise in frustration and failure. Dictation from my watch is as great as I was hoping for, with one major exception – unlike Google Now in Android, it doesn’t display the dictation as you’re speaking. Often I find myself talking to the watch and hoping it hears me right. It’s not the worst thing in the world, but it’s a noticeable step back if you’re used to Android’s dictation. The good news is that the microphone on the 360 is pretty sensitive, so I can whisper commands to it and it registers them perfectly, which is great for setting a quick reminder or saving a quick note. This is a lot quicker, and more subtle, than taking my phone out for the same action. Other frustrating quirks: you can start a text message directly with your voice, but not a Hangout message. Dumb. Media controls could use some rethinking, as right now you can only play/pause music if the media is already playing on your phone and active in the notification shade. Considering how easy it is to dismiss notifications on accident, a notification history area would be nice. Finding and launching an app without using voice commands is a pain, as it’s hidden away behind a couple of menus. 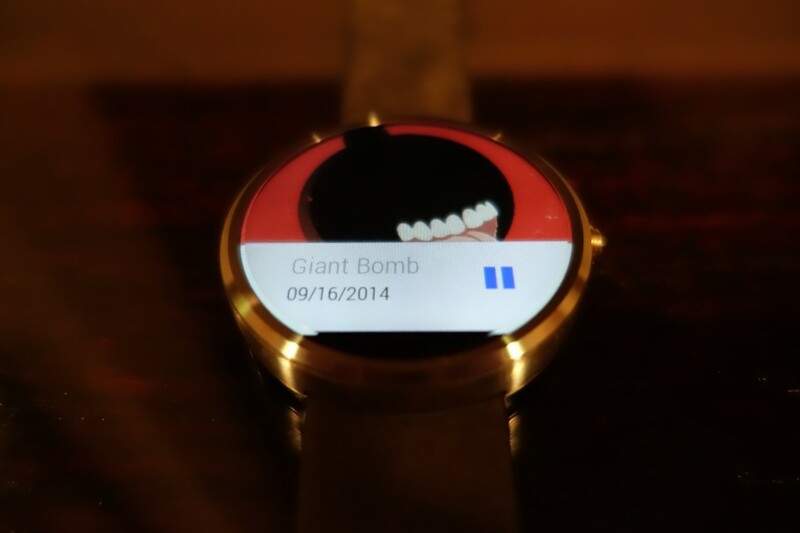 Android Wear inherits some of Google Now’s more annoying quirks, too. Accidentally swipe away that weather card? Well, it’ll come back. Eventually. Probably. While Android Wear still suffers from a frustrating lack of officially-supported custom watch faces, Motorola has a pretty solid selection. My personal favorite is Classic, which displays the current day of the month, and subtly shades areas of the watch to indicate when I have calendar appointments. There’s also a red “countdown” ticker in the upper left that counts down from ten to one when I have an upcoming appointment. In the following photo, the day of the month is the 17th, I have an event starting in eight minutes, as well as calendar entries from 8:20-10 and 11-12. This is a remarkable amount of useful information provided in a subtle package, and shows how even smartwatch without notifications can be useful. I can’t wait to see what people do with full-fledged custom watch faces – I already have some ideas of my own. How does it compare to Pebble’s software? Let’s make one thing clear: even in this early stage, I think Android Wear is leaps and bounds over what the Pebble offers. The Pebble isn’t bad, it’s just basic, and I think there are some aspects of Android Wear you won’t appreciate until you’ve used a Pebble. For example, clearing a notification on my wrist clears it on my phone, which is awesome, as having to manage notifications in two places degrades a lot of what makes notification triage useful. It’s also a small thing, but muting the watch to prevent notifications is much simpler on Android Wear – just swipe down from the top. I find myself using this frequently for meetings or lunches. This stands in stark contrast to the Pebble, where you have to dig through a couple of menus to find the right toggle. It was enough of a hassle that I never bothered to do it unless I was really sick of notifications. In general, I find myself more tolerant of notifications on the Moto 360 than the Pebble. Maybe it’s just that “new device afterglow”, but I think it’s also the fact the vibration isn’t nearly as strong, combined with the fact I can delete and archive e-mails, reply to messages, and dismiss notifications directly from the watch. This make me feel like I’m being productive, rather than just being informed of things that I’ll have to be productive about later. What about that Apple Watch? Comparing it in any meaningful way to the software on the Apple Watch would be silly, as I haven’t tried it and neither have many others. I will say that, when comparing Google and Apple’s approach to watch software, I prefer Google’s. We now live in a bizarro-world where Apple’s approach and UI appears unfocused and busy, while Google’s approach and UI is focused and minimalistic. I honestly think there’s way too much going on in the Apple Watch UI – I’d rather swipe and tap giant buttons then try to aim for tiny touch buttons and constantly miss. In my mind, a smartwatch is for things that either take 10-15 seconds at most, or for constant information I don’t want to drag my phone out for (pace/distance while running, directions while navigating). If I’m digging around a smartwatch interface for longer than a minute, something’s gone wrong. How is it for fitness? I’ve already written a great deal about the Moto 360 as a fitness device, but the tl;dr is that the 360 is surprisingly great at collecting step and heart rate data, it just needs to send it somewhere. Hopefully that “somewhere” is Google Fit, coming in the Android L release. So…where does that leave things? My general rule for recommending something without hesitation is that it needs to blend in seamlessly with your life; technology should enhance your life with as little conscious thought as possible. 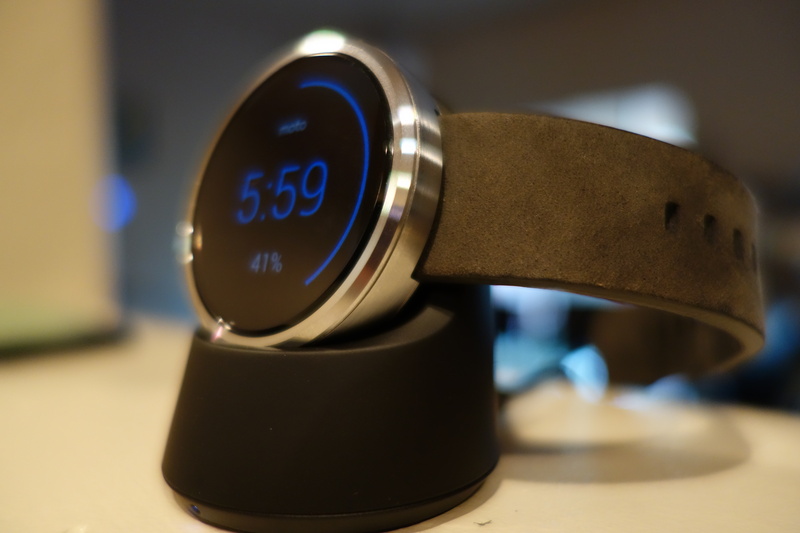 The Moto 360, and Android Wear, aren’t quite there yet. That’s not to say there isn’t an audience for this device – if you own an Android phone, really want a smartwatch, and can tolerate the less-than-ideal battery life, this is the one to get. Period. Just understand that you are essentially helping Google beta test Android Wear, albeit in a pretty fantastic chassis. I’m never one to count on a software update to fix problems – hardware is purchased as-is and any updates are just a bonus – but I think we can be pretty certain that Android Wear is going to get a whole lot better in the next 6-12 months. If these updates come with better battery life and performance, all the better – but don’t buy the watch expecting that to be the case. In the tech world there’s never any harm in waiting, and that goes double for smartwatches. This market is just getting started, and I think what we see in the next couple of years will blow away what we’re seeing today, the same way innovation in the smartphone market exploded after the original iPhone. I said in my Pebble review that my ideal smartwatch would be a Pebble, plus a microphone, plus a FitBit – and the Moto 360 is basically that, with a few unfortunate hardware and software quirks thrown in the mix. If you can’t wait, go for it – I don’t think you’ll regret it, and this is absolutely the smartwatch to buy if you have an Android phone and dig the design as much as I do. Just go in knowing its limitations, and with the knowledge that the second or third generation of these devices is going to be killer. I completely agree with you. I’ve had many people stop and ask about my Moto 360, and after going through all the cool things it can do, I suggest that they wait. With the exception being that they’re really into being early adopters, and the cost is not a big deal to them. As you said, right now we are beta testing Android Wear and I can’t really recommend people be beta testers…I’m not normally fond of it myself. 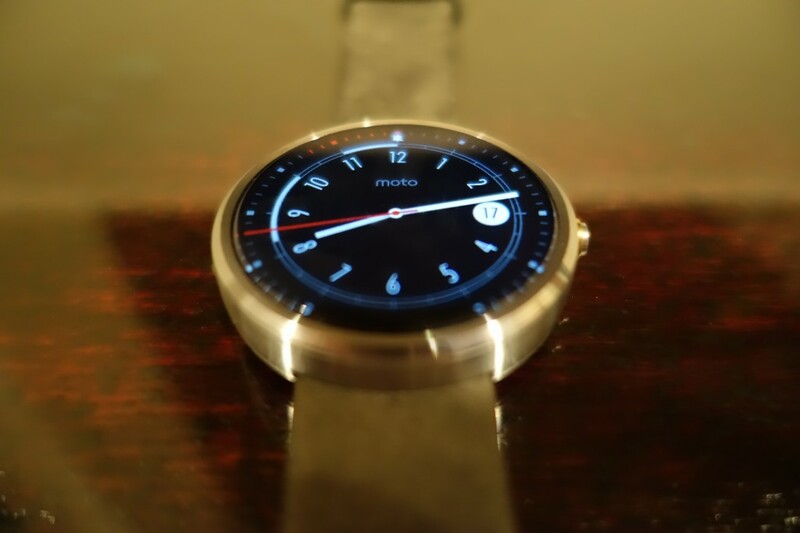 I think the Moto 360 v2 will be amazing. The first big update to Android Wear has already resolved two of my issues and gave a bonus! 1. I can now have ambient mode on and not have to charge the 360 during the day with normal use. 3. Offline music. I admit that it’s not as useful on a device without GPS for run tracking, but I listen to music often and when my phone is charging I can stream music to my home speakers from the watch. As of right now, the ability to start media on my phone from my watch (without forcing the ‘feeling lucky’ mix), GPS with a standalone Endomondo app, on demand cards, and the ability to start Hangout messages are the only things in my way of a nearly perfect experience. How do you feel about your 360 experience after the update? Thanks for reading! I’m still pretty happy with the 360, especially after the recent updates. Battery life seems a bit better (though I still haven’t dared to try ambient mode; maybe I should), and the latest Motorola Connect app update added some fun new watch face options. I also love that I can hide the card preview from the watch face, as I generally like to have a pure, unadulterated watch face, especially when they look as good as the 360’s do. There’s still some frustrations I’d add to yours – voice commands still seem hit-or-miss, and need to account for human hesitation the same way Google Now on Android currently does. Hopefully that’s coming with whatever Android Wear update accompanies 5.0. I also want to see official custom watch faces. Considering how quickly it charges and your availability of qi chargers, turn it on for a week and see how you feel about it. Yes, I find myself switching between Pascual and custom (a pic of thinking Hobbes with “Hobbes” right beneath “Moto”) and hiding the preview card a very welcome feature. Though I’ve missed a few notifications with the preview card hidden, either the watch just would not receive the notification or it didn’t vibrate. I had one experience where I got a notification and I didn’t see the watch quick enough nor were my hand’s free, those aside glad to have it. Completely agree with voice commands. Not mentioning that was an oversight on my part. Another aspect of having Android Wear that I love is that I can broaden my Android phone scape. I currently have a 2013 Moto X and the Active Display and Moto Voice/Touchless Controls basically locked me in with Motorola. Android Wear has replaced both of them for me so I can look for devices with better hardware. On a different note, and please let me know if asking you this is better done in a different forum. Have any suggestions on an upgrade from the Moto X with the following in mind? I want a device with a way better camera, wireless charging, quick (relatively) OS updates, higher capacity battery, and good WiFi and Bluetooth radios. Bonus features being water/dust resistance, front facing speakers and an IR blaster. I’m currently considering the Nexus 6 and G3 but both are much bigger and more expensive off contract then what I’m used to. The charging speed is very true – I’ve also just found that ambient mode doesn’t really give me all that much, though. Usually when I want to see the time, I’m able to trigger the display pretty easily anyway. Still, it’d be an interesting experiment if nothing else. As for the phone question – this is as good of a forum as any! I wish I had the answer though, because I’d probably be buying the phone right now myself. The Nexus 6 looks tempting, but without using one myself, I can’t really vouch for it. I think the Droid Turbo is a surprisingly compelling option, but is unfortunately limited to Verizon. The LG G3 might fit most of your requirements as well; I was pretty shocked when they recently announced that the G3 would be getting 5.0 this week (at least in one market – US release will take longer, obviously). Personally I’m still looking for that Perfect Phone, and my current plan is to hold onto my HTC One (M7) as long as it lasts, or until I find it. Maybe it’s the Nexus 6, but I feel like that’s unlikely. – With it off, I still need to charge every night. With it on, I still don’t need to charge mid day. I’ll turn it off if I expect a long day and night with limited charging options. Thankfully that has not yet occurred…the thought of not having a charging option for an entire day (with no portable chargers) terrifies me o_o. Yes, when I read about the Droid Turbo I was jealous that this wasn’t the Nexus 6! There is the non-Verizon version, Moto Maxx, but whether it makes its way to the U.S. is another story. The only drawback for me are the capacitive buttons. I can probably get used to having them again but knowing that the platform is pushing forward with virtual buttons concerns for device longevity. As soon as there’s a killer feature that only software keys can take advantage of, I’ll want to replace the phone. The best choice might be to be patient. Sony has shown to be more aggressive with software updates and since their Z series seems to be on a semi-annual refresh path the Z4 compact might have a 1080p display and built-in wireless charging. The latter being the only reason why it’s not my top pick now. What are your big checkboxes for your perfect Android phone? – Relatively fast OS updates. – As little bloatware (carrier or OEM, but especially carrier) as possible. – Right now I’d say 4.7-5.2 inches, but that might change if I end up loving the Nexus 6. I really liked the iPhone 6 Plus’ size when I briefly played with it. – Waterproof. I’ve never had a waterproof phone before, but it seems like it’d be fun. Your point about the display is what worries me about the G3 as I’m not hearing good things about its outdoor visibility, color accuracy, and viewing angles. Since we seem to be looking for the same device, I really look forward to your N6 review! Especially your opinions on the camera considering your experience with both the M7 and N5 cameras. I lost my point & shoot some years back and the phone cameras have left me seriously wanting more (Droid X -> GNexus -> N4 -> Moto X). Well, reviewing the Nexus 6 requires I buy one, which is up in the air at this point. If nothing else, I may post about why I *didn’t* buy one.